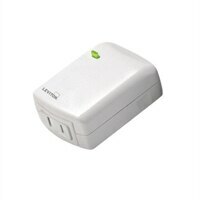 Schedule or dim your plug-in lamps from anywhere. Simplify control of the residence - schedule lights and connected loads to turn on/off at specific times or based on sunrise/sunset, easily group smart devices into rooms, and create scenes to activate multiple lights at once. Customize your experience with adjustable fade rates, maximum/minimum illumination levels, and more if desired. Reduce energy consumption, provide dramatic scene transitions, and utilize the wireless affordable plug-in for table and floor lamps.